I’ve tried to share my experience, training and successful case outcomes through many of the candid and detailed pages and articles you will find here on my website. I have personally penned each page which shares some 30+ years of experience in Trust & Probate matters, Finance & CPA issues, Real Estate Cases and Estate Planning matters. Several clients and close friends have encouraged me to publish some comments and notes that clients have sent me over the years. I will start with just a handful. I insist on obtaining personal permission from each client who’s comments are below. As I look them over, I am humbled and grateful for your initial sharing and current-day willingness to share publicly. Hi David I want to thank you for your time and effort, you did an excellent job and you produced great results. You are a 1st class lawyer with no B.S. just straight up facts. Again we really appreciate you for all your time and hard work. I hope you are having a fantastic life. Mr. Crockett’s depth of knowledge and experience has been of enormous help to our family over the years in a wide range of areas. For our real estate business investment David advised us on asset protection and established our corporation. David was always there to help us with real estate issues over the years. David was also exceptionally helpful assisting in an out-of-state probate matter handling court proceedings and filing related tax returns. Depth of knowledge and professional conduct is foremost with Crockett Law Corporation. We place our complete confidence in David and recently completed our family trust and will with him. Thank you David. You were a great help… At a time when things were pretty bad for me, David stepped in to help. He did it upfront risking his time and effort, without one penny up front. That really helped me out a lot, as I had nothing. He was also very personable and knowledgeable. He gave me the piece of mind I needed to get through my problem with my family and my mothers trust. That wouldn’t have been the case had I not contacted him. I recommend him highly to handle your case. Crockett Law was informative and prompt in helping my family resolve our parents’ estate. He was also a great coach to me as the trustee when it came to responding to family member questions. David Crockett of Crockett Law Corporation has been our attorney since learning of his expertise when he was a client of ours numerous years ago, Mr. Crockett has done an exceptional job in handling our multiple corporations accounting and tax filings as well as numerous other legal matters over the years. We extended that relationship further in having Mr. Crockett create our family trust and the execution of such as the trust attorney. Mr. Crockett has a clear understanding of the type of construction we are in and has made it a priority to assess our changing needs over the years. Our experience with Crockett Law Corporation has been excellent! Wife’s Inheritance in jeopardy. Situation Bleak. We sought out & found the BEST Lawyer. Mr. Crockett recently helped my family out in a huge trust and real estate lawsuit mess. My wife and her two brothers inherited equal thirds of a large property that had two homes on one lot as a result of their mothers’ passing in 2002. The Orange County home was put into a trust a few years later by way of Trust documents that were drafted by the eldest brother’s business attorney – who apparently had no estate law training. The eldest brother and his new wife were living in the family home since the mother’s death in 2002 and had the most to gain. My wife and her younger brother both have homes of their own, and would have preferred to sell the home in 2002 but did not as an attempt to be compassionate to their older brother. My wife and I live nearby the property and the middle brother lives out of state. In 2013 the eldest brother (who was living on the inherited family property) died unexpectedly leaving his new wife and her adult children and their wives all living on the property. There were 5 adults living there and running a family construction business from the property that had extensive parking for their business vehicles and significant storage spaces for their construction supplies. This unusual property made it unnecessary to lease shop space as would any other similar business. They were not maintaining the property and it was falling into severe disrepair. They wanted to continue to live there essentially rent free going forward though they were all but strangers to the surviving beneficiaries. My wife and her surviving brother absolutely wanted to now sell the their inherited home and approached the now-deceased older brother’s widow. She had a good thing going and did not want to move. She claimed she was now part owner and she felt entitled to that property. The Trust documents that the deceased brother’s business attorney had drafted were a joke! A law professor’s first year students would break out in hilarity it was so bad. It was as if the Trust documents were ordered off a random Internet Legal documents website for $19.95. The trust document didn’t even state who the trust beneficiaries were and left out other basic stuff. Finally, after much pressure, the widow reluctantly agreed to listing the home with a Realtor and signed the listing agreement. The home received offers. One was accepted and the property went into escrow. The clock was now running. The widow, her adult kids and their wives now had a date certain and would have to move by the time escrow would close. The widow was due a 1/3 of the sales proceeds, so she’d eventually have a down payment to purchase a home or money for whatever. One third would be a significant pile of cash. Apparently it became all too “real” once a move out date was known. The widow, not a beneficiary of the Trust, but a potential inheritor of a portion the sales proceeds, hired a lawyer and filed a trust and real estate lawsuit and lis pendens action which was a huge monkey wrench. The sale could not close because of the lawsuit. The title was in jeopardy. The R.E. Broker was threatening because his sizable commission was legally owed him and now “on hold.” Worse, the buyer –who had sold their home on contingency– were going to be homeless and had every right to sue for loses! The lawsuit had all sorts of ridiculous claims that would have taken several years to get through the courts system and would have cost tens of thousands of dollars in legal fees. We saw my wife’s inheritance slipping away as we realized we needed to hire 3 separate pricey professionals: (1) a Trust litigation attorney to challenge the crappy Trust documents in some downtown Probate court, (2) a CPA to unravel the 12-years of of accounting to help us reach a fair settlement offer, and (3) a Real Estate Lawyer to deal with the now in-limbo Real Estate transaction that might bring us yet another lawsuit from the buyer for breach of contract and from the Realtor’s Broker for a sizable lost commission (the R.E. Lawyer would have to untangle the title history, negotiate with the Realty Company, the buyer, and several vendors who had pay demands awaiting to be paid via escrow). We researched and called several lawyers and professionals and one lawyer’s name consistently bubbled to the top of the list. That was the lawyer that other lawyers would call if they were in our predicament. Turns out this lawyer had all three skill sets in one expert: Trust litigator, Tax Lawyer and CPA, and a licensed Real Estate Broker/Lawyer. We hired David Crockett on the spot. David Crockett was the only person we’d trust to attempt to undo such a FUBAR mess. David communicated with my wife and her brother regularly, was available over the Thanksgiving weekend when my wife and her brother got together out of state, answered all emails immediately, offered both hope and legal advice that played out just as he speculated it might, and was able to settle the mess in several weeks – not several years as we feared. David was able to negotiate with the widow’s lawyer, the escrow company, and the title company to allow the escrow to close and worked feverishly to settle the quagmire with minimum cost and a result that was palatable to my wife and her surviving brother. As Mr. Crockett is also a Certified Public Accountant, he was able to organize and make sense of all the widow’s financial claims and also was able to convince her attorney of all of our claims for repair costs, missing rent, back taxes and other damages. We owe Mr. Crockett a huge debt of gratitude. We got paid our share of the house sale proceeds right out of escrow and had the lawsuit dismissed. Sorry to be long-winded, but I suspect most Trust and Probate challenge cases must be as complex as ours. Had we only had David’s counsel in 2004 when my wife signed the crappy Trust documents without getting a 2nd opinion. We highly recommend you speak with David before choosing an attorney for your legal or estate matter. 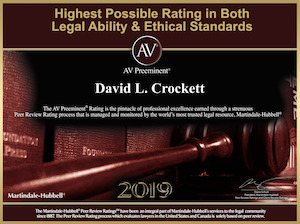 I have the pleasure working with David Crockett since 1991 as my personal attorney as well as being the attorney representing me on numerous business transactions. He has also been my tax attorney/CPA for over 20 years. During all these times, I have found David to be the most honest and sincere person to work with. He always looks after what is best for me and my business and always provides sound advice and guides me to the right direction to get things done and resolved for me in a timely manner without any hesitation. In this age, it is very difficult to find someone whom you can really trust. But having David as my attorney, I put my entire trust in him as I have confidence in him that he will always deliver what he promises and commits. Mr. Crockett has been invaluable to beneficiaries’ understanding of Trust administration and dispute resolution when communications presented major challenges. His timely direction resulted in moving to arbitration and dispute resolution. Mr. Crockett has been a trusted adviser for over 20 years on matters of legal and tax matters. In addition, Mr. Crockett was selected to represent my ownership of property involved in partition litigation outside my state of residence. His judgment is excellent. David Crockett has been invaluable in helping me through a very difficult time. My mother had passed on leaving me with a very poorly written Trust, and with his knowledge, compassion, and expertise; The Crockett Law Firm was able to resolve this very sensitive matter. From my initial meeting, Mr. Crockett listened to my situation and offered several suggestions and options on how to approach and how to achieve the best solution. All of my questions were answered, no matter how trivial, and we have now concluded what was initially an enormous challenge for me, and I would highly recommend the services of The Crockett Law Firm. I have now been with this firm for many years, and look forward to a continuing relationship, to guide myself and my family, through any legal matters which may arise. Our “go to guy” whenever any important decisions must be made. David Crockett has been our attorney for the past 7 years. Through the years he has been our “go to guy” whenever any important decision had to be made. As owners of a small business we depended on his advice whenever major decisions had to be made. His knowledge of accounting and tax law were invaluable to us in both business and personal decisions. We sought David’s advice when we decided to sell the business and don’t know what we would have done without his wisdom and knowledge during that time. When it was time to think of a Will and Trust we again went directly to David. David came highly recommended to us by another business associate. When we met David it was apparent he was knowledgeable, but in working with him we found him to be a man of great character, honest and trustworthy.